^ "négligée". Merriam-Webster Dictionary. 2010-08-13. Retrieved 2012-05-25. ^ "On This Day In Fashion". onthisdayinfashion.com. Retrieved 5 April 2018. ^ "source:life Rita Hayworth - Google Search". encrypted.google.com. Retrieved 5 April 2018. 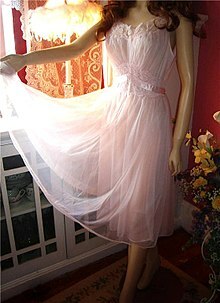 ^ "Negligees on rise in UK bedrooms". BBC News. 2004-12-09. Retrieved 2012-05-25. This page was last edited on 11 May 2018, at 23:59 (UTC).